When I help clients set up a web site, we will install Wordpress, select a theme and add test content to see how everything looks. But the site isn’t ready for visitors and the client invariably asks how to hide the site from the public until it’s ready to go live. I’ve usually explained that having hoards of visitors coming to your unfinished site isn’t going to be a problem, and that getting traffic to your site is hard work. Even though I still feel it was a reasonable solution to take a page from Frozen and let it go, I decided to find a complete solution for those few visitors who might come across your unfinished site. Out of the Wordpress plugins I looked at, I recommend Coming Soon Page. It’s simple, looks professional and has several additional features like a countdown timer and the ability to get visitors’ names and email addresses. This is how the default Coming Soon page looks. You can change nearly everything you see if you want, but even if you only change the text, it still looks great. In case you’re not familiar with installing Wordpress plugins, I’ll go over the entire process step by step. If you’re already comfortable doing it, feel free to install the Coming Soon Page plugin and skip the next section. In the Wordpress sidebar, click on Plugins, then Add New. You should now be on the Install Plugins page, where you can search for plugins. In this case, search for coming soon page. Just so you’re aware, you can click on the Details link to see a longer description of the plugin and to see how many other people have downloaded it. I tend to look at the number of downloads combined with the rating to gauge whether the plugin is worth looking at. I also like to see a plugin that has been updated recently, although some mature plugins still work well and don’t need frequent updates. It’s also a good idea to check the plugin support page to see if there are any major issues you should be aware of. I already did all that for you, so just click Install Now, then OK to confirm the plugin installation. Depending on your Wordpress configuration, may be asked to enter your FTP credentials. If not, that’s okay too. With the plugin installed, it’s configuration time. Go to the newly added Coming Soon ⇒ Template option in the Wordpress sidebar to adjust the settings. The Display tab is where you can change the background of the Coming Soon page. You can either use one of the provided backgrounds, or upload your own. This would be an ideal use for some stock photos. You can also adjust how the logo, content and email buttons look. This plugin gives you a lot of control. You can change the fonts, colors and even the opacity of the content box. These changes are completely optional. If you’re happy with the way it looks, feel free to skip them entirely. To modify the actual text that will be shown on your Coming Soon page, go to the Content tab. You have the option to upload a logo if you have one but you can ignore it otherwise. You will want to customize the page title, headline, description, disclaimer and footer. I left the email field placeholders alone, but it’s up to you. You can also change the contents of the thank you text that will be shown to users if you’re planning to collect visitors’ emails. And last but not least, you can enable the countdown timer by entering the date when your site will be live. Click the Save & Preview button to save the settings and see how your coming soon page will look. Once you’re happy with how the page looks, go to Coming Soon ⇒ Settings in the sidebar to enable the plugin. Set the Status field to On, and configure the other settings as you see fit. 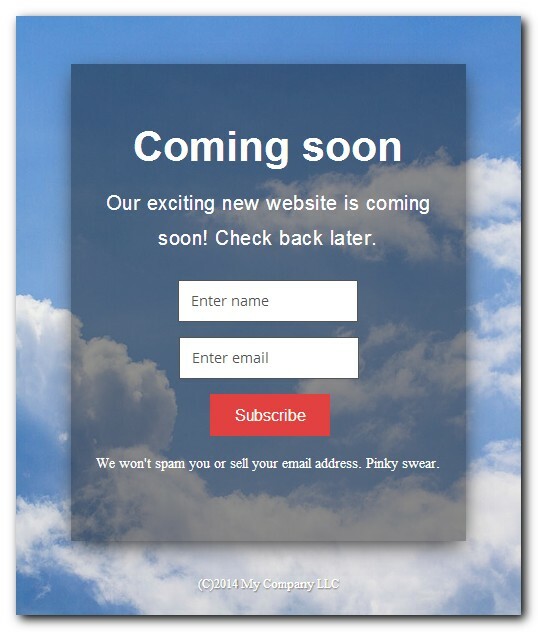 It’s worth filling out the Social and SEO fields if you’re going to have the Coming Soon page showing for a while. When you click Save Changes you’ll see a message that Coming Soon is On at the top of every page in the dashboard. This acts as a reminder that your site is only visible to logged in users. If you have a caching plugin enabled, clear the page cache or else you won’t see the Coming Soon page. You’ll also need to log out of Wordpress. If you’re logged in, you’ll see the site like you always do. You can either log out of Wordpress or open an Incognito window to see how the site looks to everyone else. Either way, make sure you’re not logged in to see the Coming Soon page. I’m mostly joking, because you probably already knew that, but I’ve seen plenty of half-finished sites that have languished for years. I recommend setting a date for the countdown so you have a goal to work towards. It also gives your visitors an idea of when to come back to see the live site. And instead of aiming for perfection, just aim for good enough, then improve on the site as you go. One last thing. If you want to use a more temporary maintenance mode once your site has already gone live, the Easy Pie Maintenance Mode plugin written by the same author as Coming Soon Page works well. The two plugins are similar to configure too. Hi, I'm Dan. This site is here to help you enjoy using technology and find the right services for your needs. As a solopreneur, you have a lot to worry about. Technology shouldn't be one of your worries. Download the free tech guide for solopreneurs to get started.